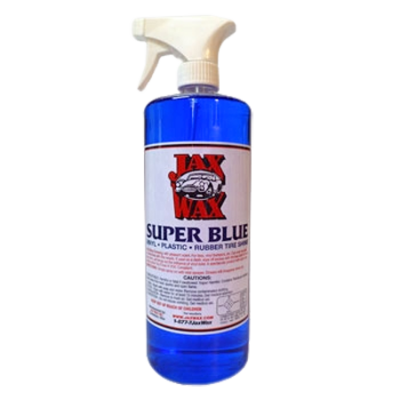 Jax Wax Super Blue protects tires and any other exterior rubber, plastic and vinyl surface from harmful UV damage and other outside elements where your vehicle is under constant attack. Jax Wax Super Blue also does an exceptional job at restoring and rejuvenating faded surfaces making them look new again. 1) Holds up better than a Water Based Dressing: As soon as water comes into contact with a water based dressing – it’s gone, washed away – kaput. With Jax Wax Super Blue being solvent based, it tends to hold up much better repelling water and moisture. 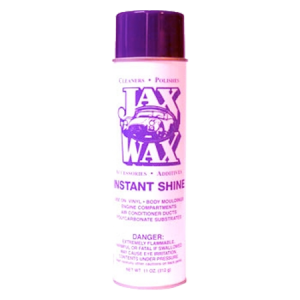 It lasts much longer.2) Does a better job restoring faded trim: Jax Wax Super Blue easily restores faded rubber, plastic and vinyl surfaces to look like new. 3) Easily removes wax marks from exterior trim: When dressing exterior trim, Jax Wax Super Blue does not just cover up any wax marks on exterior trim, but rather will remove excess wax from trim pieces. This is due to it’s solvent based formula. There is so much plastic and vinyl trim on newer vehicles, no matter how careful you may be, you will it with wax and leave an unsightly mark. Jax Wax Super Blue will remove it! 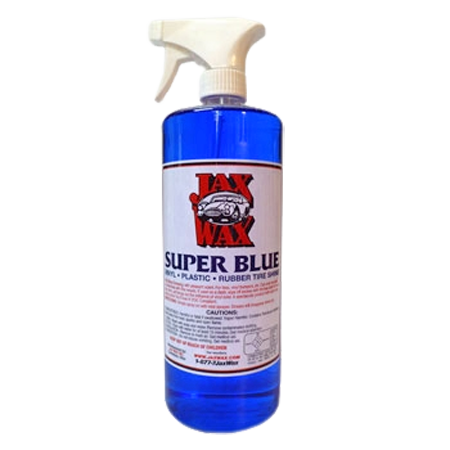 Jax Wax Super Blue is excellent at restoring and rejuvenating vinyl tops and for those final details for dressing and protecting undercarriages and wheel wells. Can even be used on wet surfaces with excellent results. 1. Either spray product directly on surface or spray on an applicator and wipe it on the surface. 2. Wipe off excess product with a towel on any adjoining surface. 3. Let product dry for a high gloss. If less gloss (matte finish) is desired, wipe with a towel when wet. Be the first to review “Jax Wax Super Blue (Tires, Rubber, Plastic & Vinyl)” Click here to cancel reply.